Towards the beginning of the book I’m currently writing, there’s a scene where my protagonist, Aly is sitting out in the back court of her tenement. She’s sorting through the metal that she and her Paw have collected (well, stolen, to be honest) from a West End rooftop the night before. She finishes up her sorting, and picks up a small silver teapot. She turns it in her hands, then takes up a small hammer, and gently tries to work out some of the bumps in its surface. She’s careful not to damage the pattern on the surface of the teapot. When I wrote this scene, early in the book, I hadn’t really thought about what the teapot was, and if it had a role other than as an object for Aly to be playing with, while her Paw comes out to have a slightly difficult conversation with her. Later, though, the teapot – which they never use to make tea, but keep as decoration – becomes an important place in which some objects (I won’t reveal which) are stored. After writing a first draft of the book, I went on a craft workshop. The company that led the workshop, The Owl and the Pussycat, beautifully upcyles old objects. 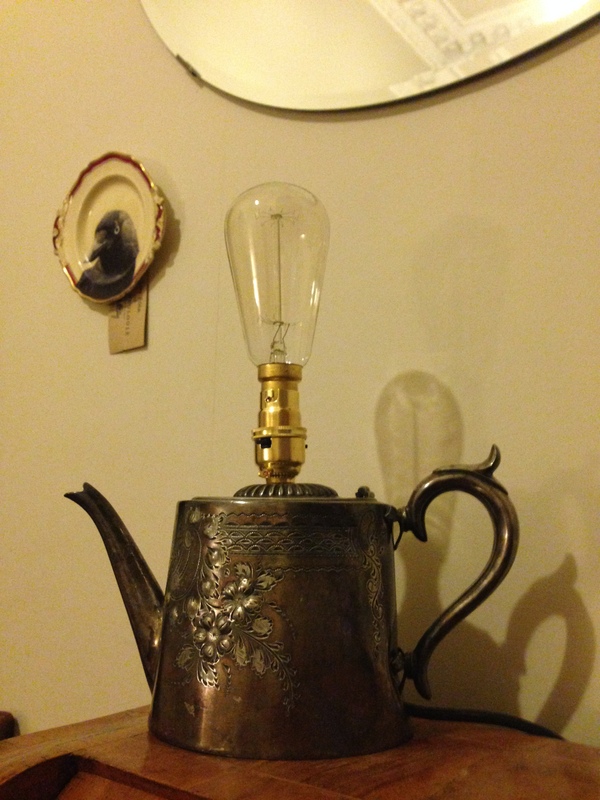 At the workshop, I’d had my eye on a sweet little copper teapot which had been made into a lamp, but didn’t buy it. When I got home, I emailed the company, who kindly said they’d put it to one side for me until I could pick it up. Over a month later, I went to another fair where The Owl and the Pussycat were exhibiting to pick up my teapot. As I neared the stand, though, I saw another lamp. This one was silver nickel, with a pattern of flowers sprayed across its side. I stopped still. It wasn’t quite how I’d imagined the teapot when I was first writing about it, but this teapot was how it should look. I said hello, and that I’d like the silver nickel teapot instead of the copper one which had been patiently waiting for me. My explanation was, no doubt, rather garbled, but The Owl and the Pussycat understood. ‘That makes the hair on the back of my neck stand up,’ she said. And now it stands on top of a beautiful writing desk I’m looking after for a friend. I switch it on when I’m writing in the winter, or at night. A talisman.